He cradled the guitar in his lap, pulled out a pick, and began to play. The song was one of his favorites, Django Reinhardt’s “Nuages,” a melancholy instrumental that was popular in France during the Nazi occupation. Willie knows every square centimeter of Trigger, and the fingers on his left hand ascended the rough fretboard and played the high yearning riff that begins each verse, then descended, gently following the melody as the fingers on his right hand picked single notes and plucked chords. He played the riff again, this time descending quickly, bending a string and shaking the guitar’s battered neck. He started to play the melody again, then bounced a chord off it— da da! —and started to play some other notes, but they slammed into each other— blonk!—and he went back to the main theme. He played the verse again, rushing it slightly and throwing in a succession of loud, falling notes that changed the tune. At the end he paused and finished with a cascade of sounds, like a leaf falling from a tree. Jackson couldn’t salvage the guitar, he told Willie over the phone. It was too busted up. Jackson did mention, though, that he had a Martin N-20 on hand and could transfer the pickup into it. Martin was the premier maker of steel-stringed guitars; the N-20, which had been introduced the year before, was a nylon-stringed, or gut-string, guitar, an attempt by Martin to make inroads in the Spanish-style market. Willie liked gut-string guitars well enough, but he was a little uncomfortable buying one over the phone. “Is it any good?” he asked. “Well, Martins are known for good guitars,” Jackson responded. Willie asked the price. Seven hundred and fifty dollars, Jackson told him. “I had just bought a roping horse for seven hundred and fifty dollars,” Willie recalls. “So I said, ‘That’s pretty cool.’?” He bought it, sight unseen. bridge, the result of his pinkie and ring finger digging into the wood as he played. “When I saw the hole coming in there, I didn’t panic or anything,” he says. 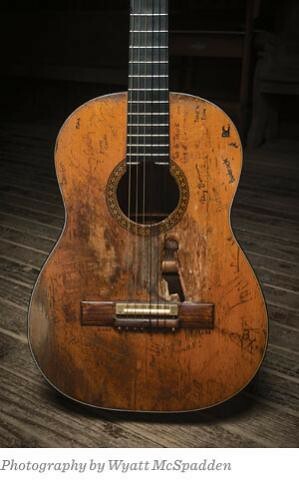 “Growing up, I played a guitar that had a big, round hole.” On “Whiskey River,” you can see Willie’s two lower fingers curling above the hole while he picks. The guitar, plugged into the Baldwin amp, sounds clear and earthy, and Willie plays standard country riffs while the band shuffles and swings. He switches between using the pick and thrumming his middle finger. On “Will the Circle Be Unbroken,” his fingers fly up and down the fretboard. spared, he asked his daughter Lana to send it to him, just to be safe. She grabbed the guitar and got it back to her dad. All things considered, Erlewine says, the guitar is in pretty good shape—except for the frets. “There are certain notes that are just pffft!” he says. “Everyone around Willie knows it. They just shrug their shoulders and say, ‘He’s doing pretty well—he doesn’t want to change!’?” Erlewine finally gave up trying to get Trigger re-fretted. “Willie’s living his life, and Trigger’s living it with him, with all the aches and pains that go along with it.” The truth is, the worn frets just force Willie to play with more force, more vibrato, more bending, more shaking, more attitude. cracks, his headstock has never snapped, and his sides and back look relatively fine. Willie can sometimes seem cavalier with Trigger during shows, lifting him high in the air by the neck, but he’s always been fiercely protective of his guitar, at least twice resorting to physical measures to take him from drunken musicians. Once, Willie roughly pinned songwriter Johnny Darrell against a wall and rescued Trigger, and another time he slugged Jerry Jeff Walker to get Trigger out of his arms. After a couple of other songs, Willie said, “Let’s do ‘Nuages.’?” He played the romantic melody, climbing slowly and ambling back down; on the second pass he climbed faster and rushed the melody—which made the slow part even sweeter. Then it was Bobbie’s turn to solo, and while she played, he sat and listened. The band did two more takes, and on the last one Willie closed his eyes for a few seconds during Bobbie’s solo. Then he opened them and looked out the window, the fingers on both hands moving but not playing, as if he were keeping them limber. He had one more verse to do, and as Bobbie finished up, he bent his head and put his hands on the guitar, and he and Trigger began to play. This entry was posted on Wednesday, November 20th, 2013 at 4:40 am and is filed under Trigger. You can follow any responses to this entry through the RSS 2.0 feed. You can leave a response, or trackback from your own site. No other Guitar has the Martin Sound. My wife gave me one on our 5th. Wedding anniversary. It is a 12 string. We have been married over 58 years. Exactly what type and size strings does Erlewine put on Trigger? several pals ans also sharing in delicious. And of course, thank you for your effort!